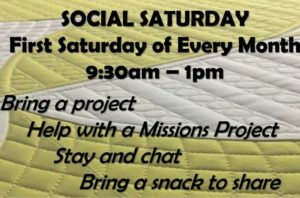 On Social Saturday, you are encouraged to bring your scrapbooking, quilting, or other project. You can also join us in our missionary prayer cards while you enjoy the fellowship of your sisters in Christ. Coffee and tea are provided. Please bring snacks to share. Childcare is not provided. Social Saturday is the first Saturday of every month. You are welcome and encouraged to bring your scrapbooking, quilting, or other projects. while you enjoy the fellowship of your sisters in Christ. Coffee and tea are provided. Please bring snacks to share.